Custom made set of landing gear for Ziroli AT-6 Texan. Bolts straight onto mounting plan with no modification. Aircraft steel and aluminum construction are used throughout the retract mechanism. Big 5/8” dia. struts and 7/16” dia. 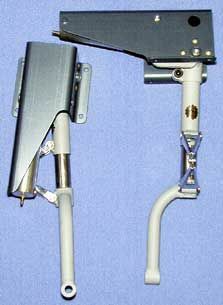 offset oleos make these retracts strong enough for aircraft weighing 20 to 40 lbs. Other features include positive up and down locks, Adjustable oleo strut for toe-in and toe-out, and 1/4” steel axles. Made to fit up to a 5 1/4” wheel.